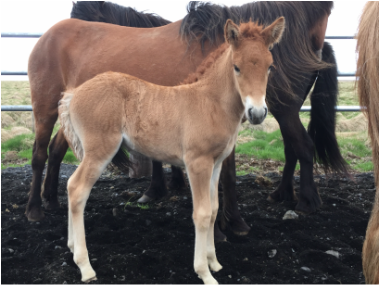 Trú frá Heimahaga is very promising mare, daughter of the great mare Krít frá Miðhjáleigu and Loki frá Selfossi. 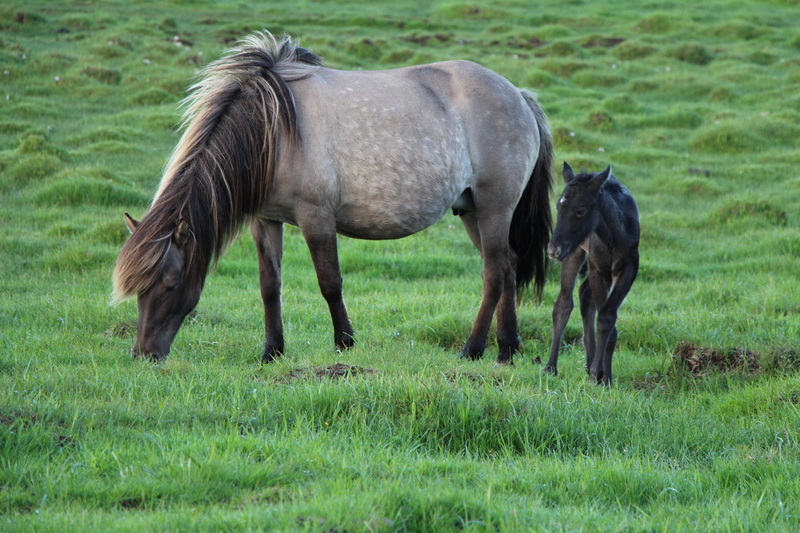 Trú frá Heimahaga is Krít's third foal, sister of Lukka frá Heimahaga and Kærleikur frá Heimahaga. She was born on the 9th of June. 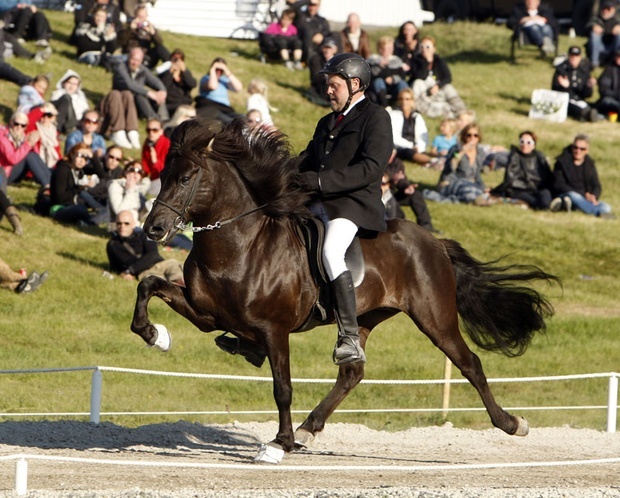 Loki frá Selfossi (8.43) is a great four gaited black stallion with 8.21 for Conformation and 8.58 for Rideability; 9.5 for tölt, 9.5 for trot, 9 for gallop, 9.5 for spirit, 9.5 for general impression and 7.5 for walk. 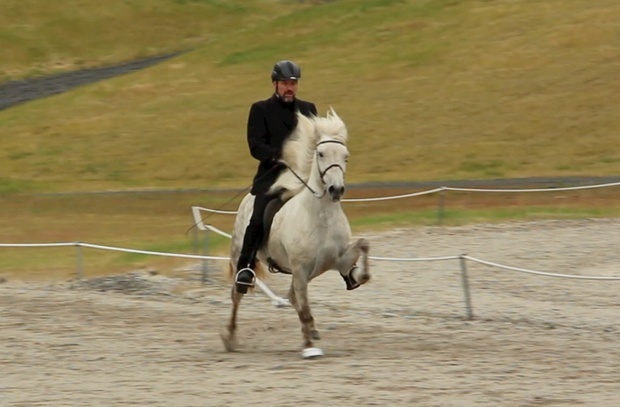 Loki has also 8.5 for slow tölt and 8.5 for canter. 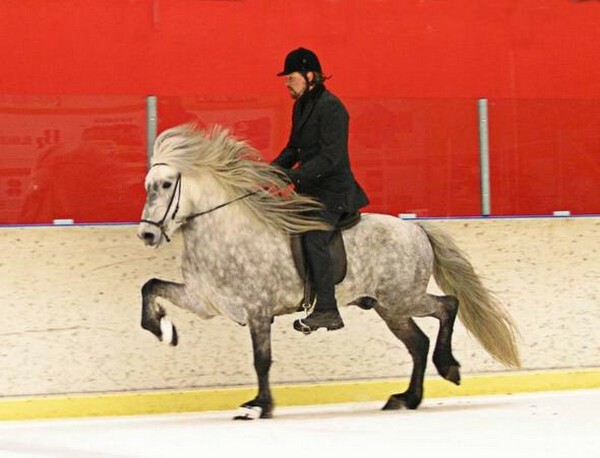 F: Smári frá Skagaströnd ( 8.34) has is a red bay stallion with 7.85 for Conformation and 8.67 for Rideability; 9 for tölt, 8.5 for trot, 7 for pace, 8.5 for gallop, 9 for spirit, 9.5 for general impression and 8.5 for walk. Smári has also 8 for slow tölt. FF: Safír frá Viðvík (8.35). Safír is a black stallion with 8.25 for Conformation and 8.43 for Rideability; 9 for tölt, 8 for trot, 8 for pace, 8.5 for gallop, 8 for temperament, 8.5 for character and 8.5 for general impression. He is son of the honoured stallion Hrafn frá Holtsmúla (8.56). ​FM: Snegla frá Skagaströnd (7.54). Snegla was a light chestnut; sorrel with a star, silver grey main and tail. 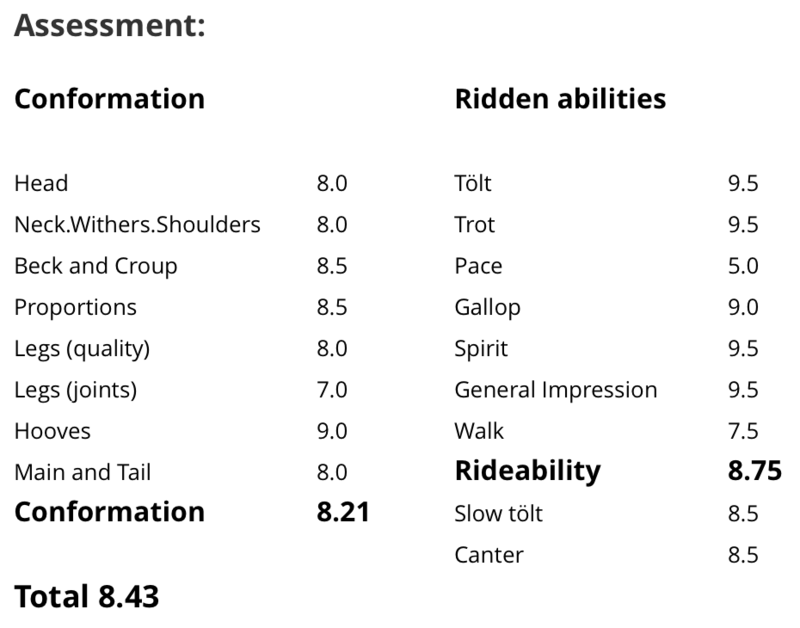 She had 7.50 for Conformation and 7.44 for Rideability; 7.5 for tölt, 7 for trot, 6.5 for pace, 7 for gallop, 8 for temperament, 8 for character and 8 for general impression. 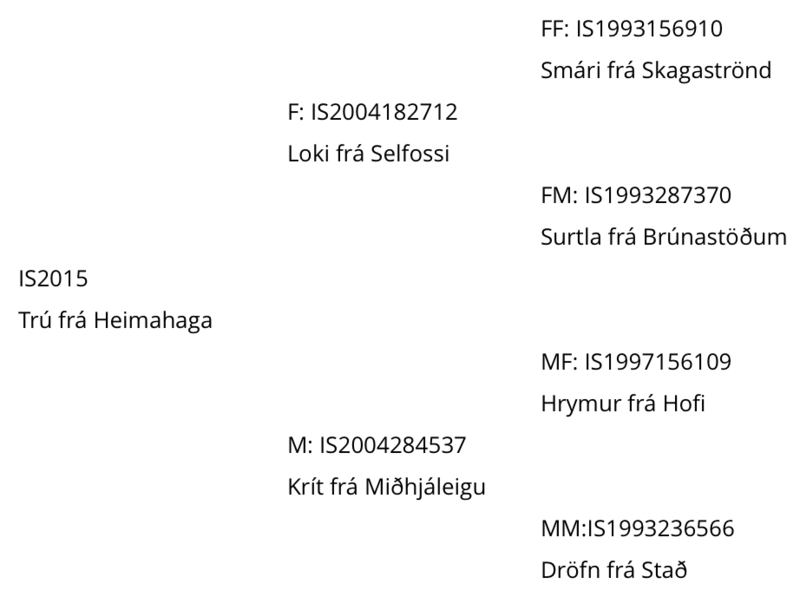 M: Surtla frá Brúnastöðum (7.65). Surtla is a jet black, four gaited mare with 7.76 for Conformation and 7.58 for Rideability; 8 for tölt, 8 for trot, 8.5 for gallop, 8 for spirit, 8 for general impression and 7.5 for walk. Surtla has also 7 for slow tölt. MF: Vákur frá Brattholti (7.99). 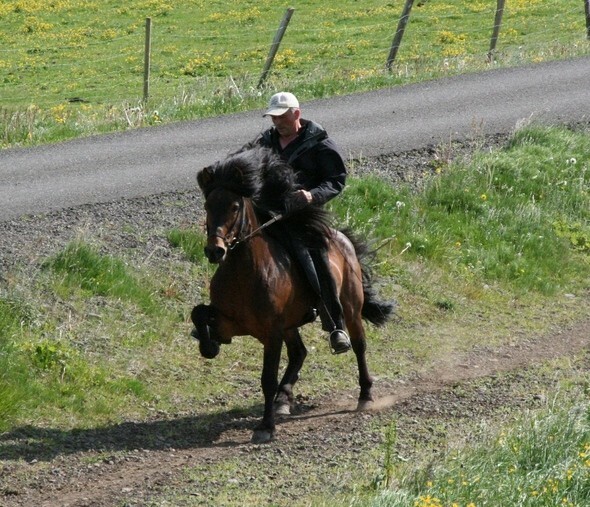 Vákur was a jet black stallion with 7.80 of Conformation and 8.17 for Rideability; 9 for tölt, 8 for trot, 6.5 for pace, 8 for gallop, 8 for temperament, 8.5 for character and 8.5 for general impression. 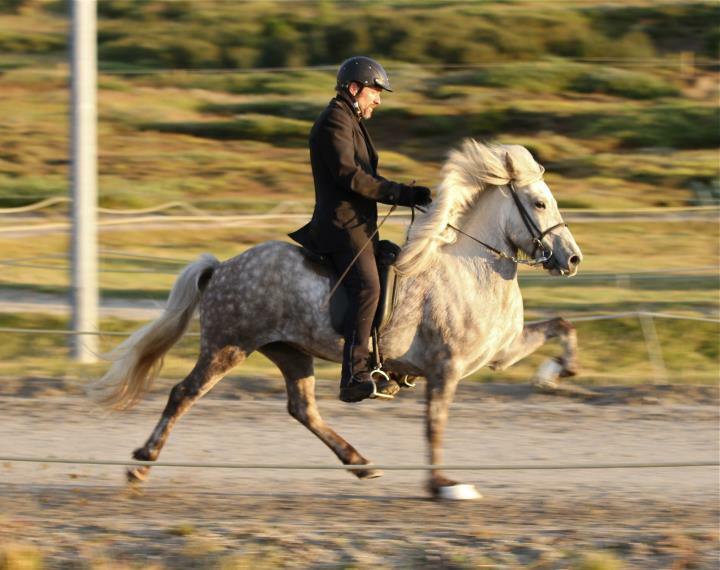 Vákur was son of the honoured mare, Perla frá Kjartansstöðum and Gassi frá Vorsabæ, Gassi had 1. price for his offspring. MM: Gletta frá Brúnastöðum (7.40). Gletta was a chestnut, four gaited mare with 7.93 for Conformation and 6.87 for Rideability; 7.5 for tölt, 7.5 for trot, 7 for gallop, 7 for temperament, 7 for character and 7.5 for general impression.